Ideeli is having a Gucci Sunglasses Sale starting 4:30PM EDT today. 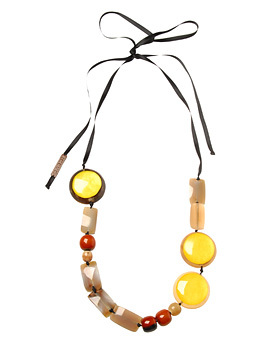 This website holds designer sales that’s only open to its members (kind of like Ruelala). Leave me a comment if you want an invitation. 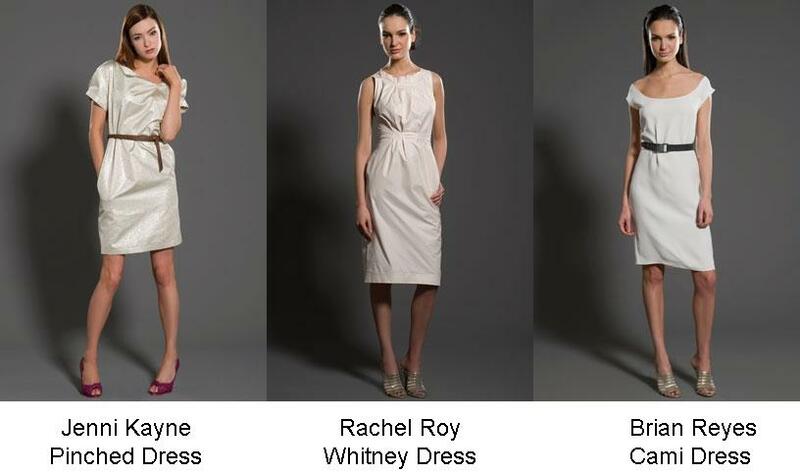 On a side note, Barneys has gotten some new Manoloes for us to look at, like the Silver Telo, the Cuttawin and the Trampa. 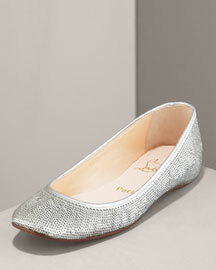 Love it, love it, love it!!! 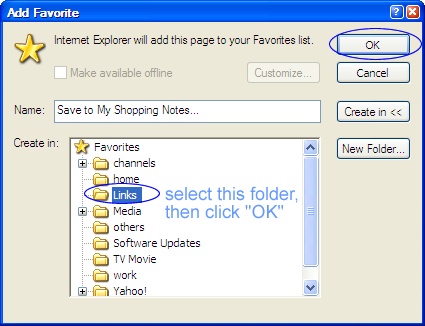 To save the hassle of copying and pasting URLs everytime, you can install the Shoppingnotes bookmarklet and set price alerts using the bookmarklet following these instructions (or refer to the step-by-step illustrations for Firefox and IE). 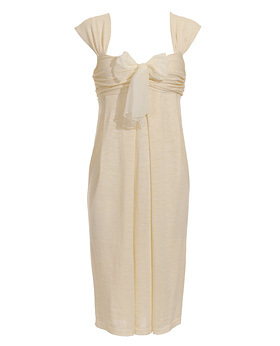 For more sale items, check out the Shopbop Designer Boutique Sale Save 30%. What I’m calling a “button” is actually a bookmarklet. It allows you to save anything you see on the web into ShoppingNotes in just two clicks. For Firefox, it’s really easy to place this button on the toolbar and takes only 5 seconds, just follow instructions here. If you want to know how to save a product into ShoppingNotes using Firefox, please see illustrations in my previous post. 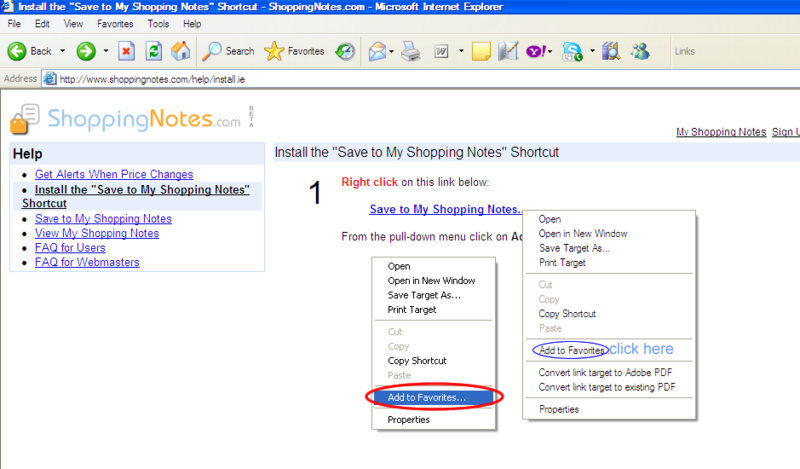 Go to the Install page, right click on “Save to My ShoppingNotes” link, then select “Add to Favorites” from the pull-down menu. After you do this, two windows will pop up, just click on “Yes” and “OK“. Then you’ll see a window letting you select where you want to put the “Save to My Shoppingnotes” link into. To make your life easier, select the “Links” folder, then click “OK”. To see the “Save to My Shoppingnotes” on your toolbar, all you need is to check you toolbar settings under “View” (on the Internet Explorer top menu bar). Make sure “Links” is checked. And if you want to move “Links” to a different place on your toolbar, make sure you unlock the toolbar first so you can move things around. 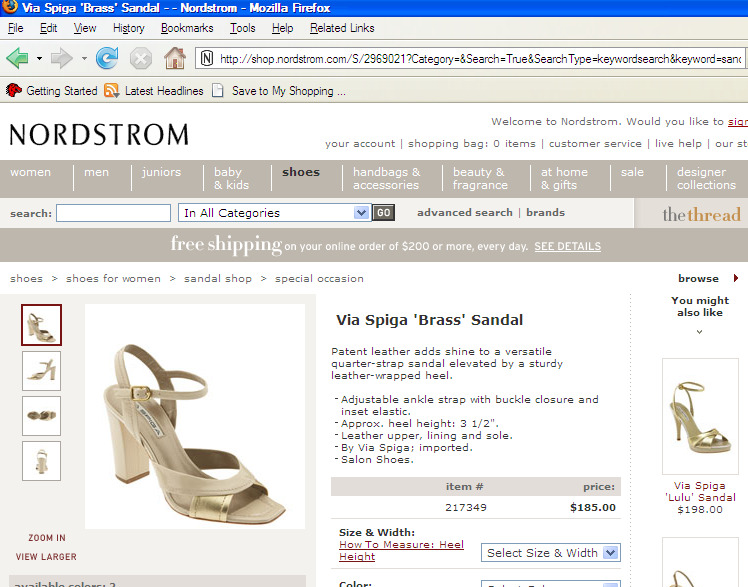 Don’t forget to lock your toolbar after you’ve moved the “Save to My ShoppingNotes” to where you want. Done!!! 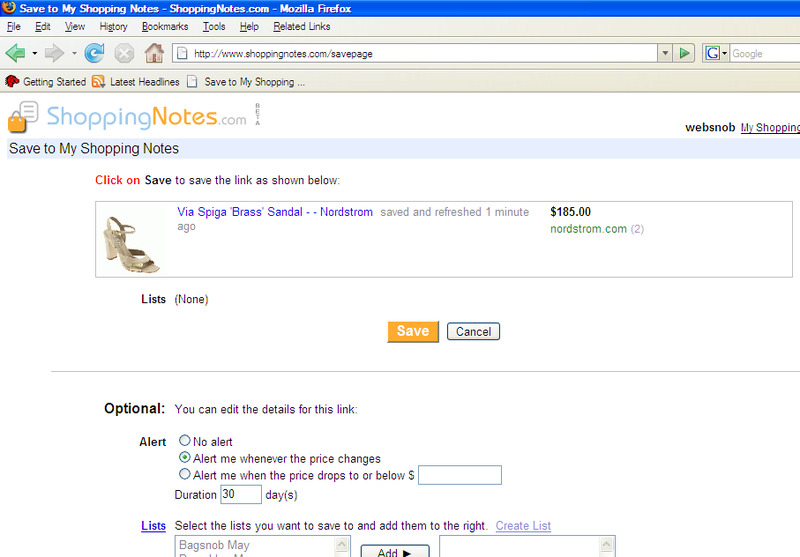 Now everytime you want to save a product into your shoppingnotes, just click on the “Save to My ShoppingNotes” button! To save a product into ShoppingNotes, follow these instructions (or refer to the step-by-step illustrations I’ve written for Firefox and IE). To save any product into your ShoppingNotes, please refer to the step-by-step illustrations I’ve written for Firefox and IE. 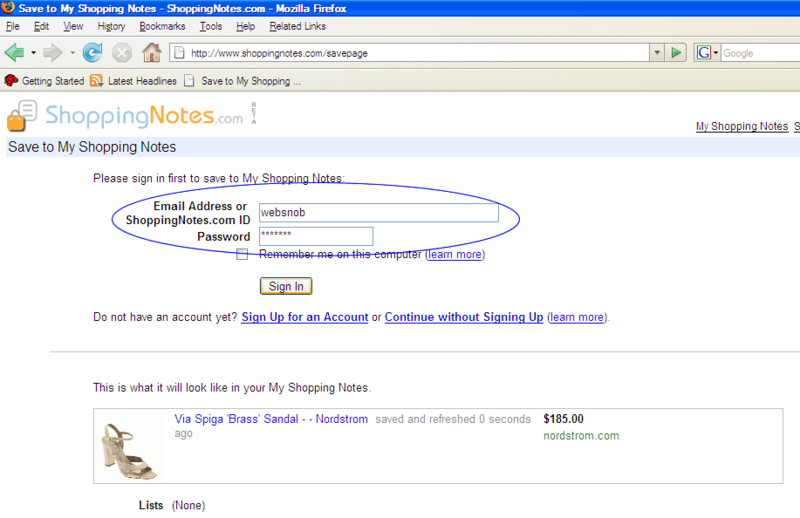 Within your ShoppingNotes you can create lists (such as “Household items” or “Back to school”), copy or move any item to a list, delete an item (from your list or your entire ShoppingNotes) and refresh price (retrieves the most up-to-date price on any product from its original website). 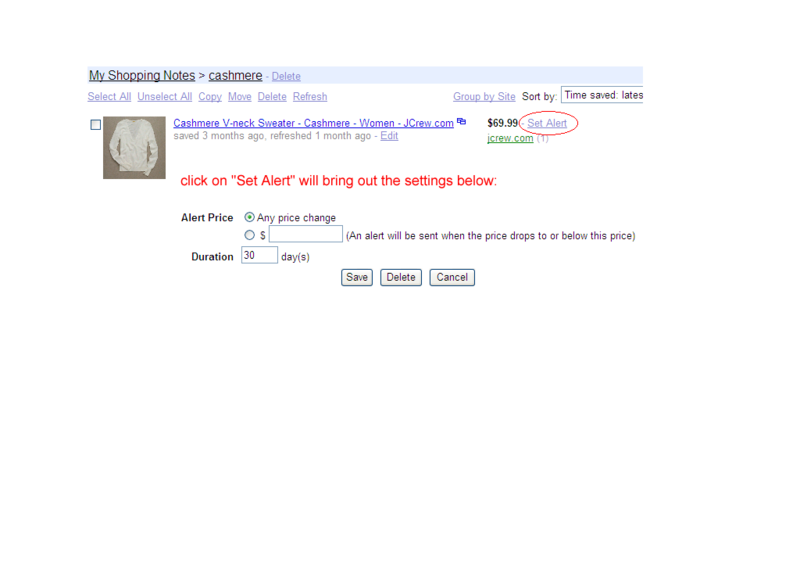 You can also sort your products in the order of price, time saved, website name or favorite level. Below is an illustration of each function. Please click to enlarge. To set price alert on a product you have saved in your ShoppingNotes, just click on the “Set Alert” button next to the price. You can choose to receive alert for any price change or have us notify you only when the price drops below a number (entered by you). The alert will be active for a maximum of 30 days. Near the end of the 30 days, you’ll get an email reminding you of the alert you have set. There’s a big “Renew” button in the email, click once on that button will renew your alerts for another 30 days.